1. Boy howdy was their registration system slick. They must have had 30 laptop kiosks set up to allow people to check themselves in. I arrived a half-hour before programming started, on the one day that they allowed $40 passes, and I was in and out in less than 5 minutes. 2. You need more than 15 minutes between panels. That is not enough time to refresh yourself and still get to the next panel that is across the convention center on time. 3. The book fair is like an Easter candy hunt for grownups. All kinds of freebies, plus candy at almost all the tables, including actual Easter candy! And the convention center space is HUGE. 4. Literary panels in academia are a bit different. Instead of a discussion of the topic, sometimes it's just a sequence of people reading papers that may or may not be closely related to the topic at hand. This was about half the panels I attended. Occasionally, these people aren't very good at presenting papers. 5. At least half the panels were strictly academia-related. The literary fiction industry's expectation that successful writers make their money from teaching MFA (etc.) programs is very strange to me. It was a good and very full day. I woke up at 6:45 AM (thanks, baby girl, for waking me up 15 minutes before the alarm was set to go off!) to get ready and bus to the convention center. I forgot only one crucial item: a cell phone charger cord. When we got off the bus, I ended up chatting with another attendee who was heading in (identifiable by her complimentary tote bag), so that was very nice. Registration was beautifully easy. I slid into the Time and Structure in the Novel panel right when it started; happily, Michael Merriam and Cole Sarar had saved me a seat! The place was packed. Very excellent panel with good discussion of how to manipulate time to add tension (particularly for literary fiction in which plot is not providing the tension). Next up was the Historical Fiction and Fictional History panel. This was one of those "people taking turns presenting papers" ones. The first two were very focused on particular historical instances and not so much on the purported goal of the panel, which was discussing *how* to do historical fiction. I had trouble not zoning out, and I didn't get a lot of useful stuff out of it. Catherine Lundoff, Michael Merriam, Conrad Zero, and I ducked out early for lunch. We went to Brit's Pub a bit after 11 AM, and our timing was great. The place was mostly empty. We got our food fast. Our food was delicious. I had the pot roast with chips and YUM! Although I need to remember to ask for the horseradish on the side next time, just to make it slightly less overwhelming. I left early in hopes of getting to the next panel slightly late. However, by the time I got to the Fascinated or Haunted: Why We Continue to Write and Rewrite Fairy Tales panel, it was not just standing-room-only, it was no-standing-room-left. I wish I'd been able to attend. I've seen (been on!) that panel at genre conventions, and it would have been interesting to see (if there was) the difference in a literary fiction setting. So instead I meandered down to the Bookfair, which--holy crap. The space was huuuuge. Small presses, literary magazines, and people trying to sell their MFA program filled the space. I was very polite to the MFA program people. I did not say, "Your MFA, eeet does nuzzzink!" Pretty much every table had candy, chocolates or other giveaways. I pillaged. Apparently, there comes a time when everybody tries to give away all their literary magazines (instead of selling them), but I didn't see it. Besides, I don't actually want to have All The Magazines to read. Had a nice conversation with the Harvard Review editor (yes, they want genre writing too), saw some interesting visual poems, got a ruler/magnifying glass, and more than sufficient chocolate for the day. Now we come to the lobster sperm metaphor. 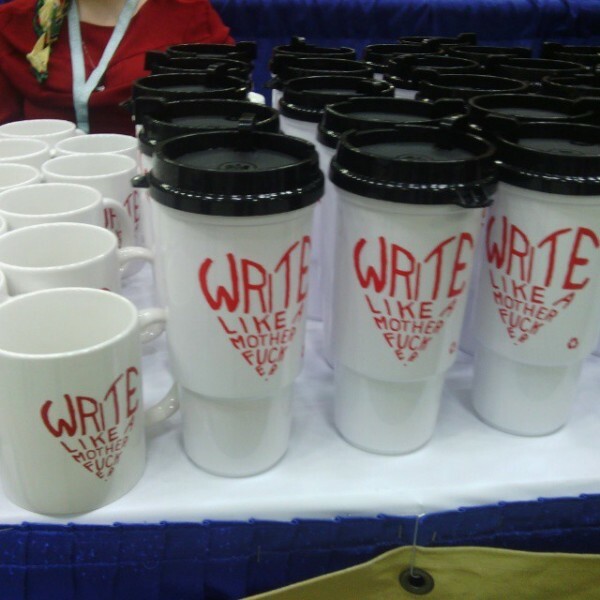 The Weird Science: Strategies to Encourage Innovative Writing in the Workshop panel seemed promising. I am often part of workshopping other writers' work, and at a certain level, every writer is a workshop of one, right? The first panelist to present her paper (yes, this was one of *those*) chose to read an essay about lobsters, interspersed with commentary about why this particular piece of writing was awesome. You see, female lobsters apparently carry around thousands of sperm inside them until the time when they choose to fertilize their eggs. They are miracles of fecundity and potential life. And then we catch them and boil them alive and eat them, sperm and all, because they are delicious that way. Possibly this was a metaphor for workshop students. Or possibly it was simply an example of innovative writing and what she liked about it. Or both. At the time, I was all, "What the hell?" but now this is one of my favorite memories from the convention. It certainly was memorable. The next presenter half-apologized for the pedestrian nature of his paper before proceeding on to give solid, concrete, useful advice--as did the last two. Substance as Style: What Noir Writing Can Teach Us About Literary Form was an enjoyable panel. One of the panelists commented that it seemed kinda appropriate that it got put in the basement on the last day of the convention! I found Sarah Cortez, police officer and poet, to be particularly interesting. Now I'm hunting down some of her books to read (something panelists do not often inspire me to do). Then I went to The Art of the Art of Writing, which was about the creation of the "The Art of..." writing book series. It was about as meta-meta as you'd expect. I confess that it did not fill me with a grand desire to go and read the series, although I have heard from other sources that the books are pretty good. It did provide an interesting window into literary fiction infighting. Allegedly, because the authors were working writers and teachers, instead of professional literary critics, some thought that the books were not ... professional? Also people give books something called a "distant read" to counteract the too-engaged "close read" (http://www.nytimes.com/2011/06/26/books/review/the-mechanic-muse-what-is-distant-reading.html). Last but far from least, the AWP conference as a whole has apparently been referred to dismissively as just being full of "people who want to be writers." Um, yeah? To which accusation, the panelist triumphantly said, "But really, AWP is full of people who want to be *readers*!" And everyone applauded, because somehow moral high ground was involved? Tot bizarre. Also, I will say that the auditorium seating at the Minneapolis Convention Center does not have anywhere near the amount of legroom necessary for anyone taller than 5'8". Most of my acquaintances left the conference before the end of the last panel, and the book fair closed even earlier, but I stumbled over Conrad admiring the long, long line of people going into the UPS store to ship boxes of books elsewhere. We went to Lotus-a-Go-Go (best egg rolls in the Twin Cities! ), and chatted about panels and books-in-progress and other things. It was incredibly packed, thanks to the convention, but it was still worth it (did I mention the egg rolls?). Then I went home, proving that my baby girl is indeed old enough that I can leave her for 12 hours with only minimal discomfort. My spouse, on the other hand, reeaaaally did not want me leaving again for the social event later that evening. Which is fair enough, because I didn't really want to go either, even if that does mean I was wussing out from a(n extremely) theoretical networking opportunity. I heard about some potentially useful alternate approaches to writingy things, it was definitely worth the price of admission, I'd do it again if I were given a geographically convenient opportunity, but it was nice to be home!